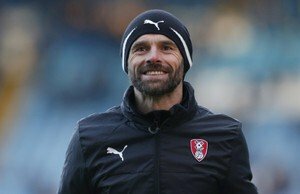 Rotherham United Manager Paul Warne says he thinks the Millers have had a successful season whatever happens in the next three games. Speaking to Radio Sheffield the Millers Boss said, ‘Over forty-six games you get what you deserve but it’s a bit of a lottery now. ‘The lads deserved fourth place which is hugely impressive for them and I’m really pleased for them. ‘We could be the best team in both the next two games but sometimes in sport you don’t get what you deserve. ‘If the lads play to a level in these two games and don’t get what they deserve there will be no complaints from me. I’ll take the criticism for doing whatever it is wrong. They’ve done brilliantly for me all year and I just hope they can finish it off with two great performances. ‘Yes it will be nice if I can get back here on Wednesday night without a deficit to chase but if we do have a deficit to chase I’ve got no issues. ‘What’s nice about having the second leg at home if you are the team that goes through doing it in front of your own fans is something that will never leave you.